Chillingham, upper Crystal Creek accommodation and tourist information guide, local weather and getting here. Tweed Valley Northern Rivers region, se qld, Springbrook National Park and Natural Bridge (Natural Arch). NSW, 2484, New South Wales, Australia. Chillingham and Upper Crystal Creek are about 12 kilometres, or 15 minutes drive, along Tourist Drive 34 (Murwillumbah - Chillingham Road) from Murwillumbah, and is the NSW gateway to southeast Queensland World Heritage National Parks, including Springbrook National Park, which is home to the truly amazing Natural Bridge (previously known as Natural Arch) and Lamington National Park. 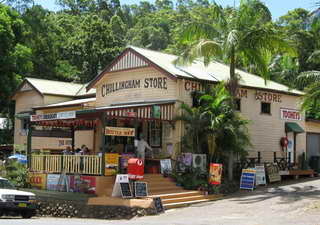 The centre of the local community, walking into the Chillingham Store is a bit like walking back into the 19th century. The difference is that this general store also has a charming tropical beer garden, offers tea and scones and old style country cooking. Another local institution is the Banana Cabana. Take a stroll through the bushtucker rainforest behind this unique fruit and vege shed, which also stocks a range of bushtucker and traditional beauty products, along with local fruit and veges, and home-made bushfood jams and condiments. A range of farmstay and guesthouse B&B style accommodation is available at Limpinwood and nearby Upper Crystal Creek, and around the village of Tyalgum 15 minutes drive south. Take a round trip driving tour from Murwillumbah to Chillingham and Tyalgum along Tourist Drives 34 and 36, to enjoy the stunning views of the caldera escarpment, and stop at roadside stalls to stock up on for farm fresh produce. Or you can enjoy the views and ambience of one of the local Cafes and Teahouses, or take a day tour with local guides, to these hinterland attractions. Chillingham and Upper Crystal Creek make an ideal base to explore the World Heritage national parks of the region. A leisurely 20 minute drive north west, will have you state hopping into Queensland, along the ridge line of the Numbinah Valley and head waters of the Coomera River, bringing you to Springbrook National Park - Natural Bridge section, formerly known as Natural Arch. This rainforest in the clouds offers excellent day visit facilities with BBQs and picnic tables, and walking tracks through subtropical rainforest, with very good interpretive signage along the way. Some paths are also suitable for wheelchair access. Want to stay in New South Wales? Less than 25 minutes drive to the south via Murwillumbah or Tyalgum, are Mt Warning National Park and Mebbin National Park. Both offer day use picnic facilities, shelter sheds and composting toilets, with short walks available through the dominant rainforest. A popular camping area is available at Mebbin National Park, and a spectacular dry weather drive through the rainforest to the Murwillumbah - Kyogle Road for a loop drive back to Murwillumbah via Kunghur and Uki. Chillingham, the first of the Volcano Villages, lies nestled inside the erosion caldera of the Mt. Warning Shield Volcano on Tourist Drive 36, which winds its way along the tree-lined Rous River through subtropical and ancient Gondwanan rainforest clinging to rhyolite rocks from the 240 million year old Chillingham Volcanics. Chat to local artists, craftspeople and residents about this "Natural Village", as you stroll along the historic walk leading from the Bushtucker Gardens, past Chillingham Store and Hall and the Old Butcher Shop - now converted to a pottery. On the riverbank opposite, the Beantree walk winds along the river bank to the local Landcare regeneration area, complete with picnic tables under the trees, and continues to Jack Connelly and Johnny Brims Park, the Rous River Bridge, Chillingham Flute Workshop, preschool and school. Further along the Numinabah - Nerang Rd, you'll find the Chillingham Community Centre where you can view the Virtual Herbarium, use the internet, or purchase fresh vegetables from the Community Gardens. See the carving of the giant black bean pod that symbolises the ford across the river know as Black Bean Crossing, marking the beginning of the Tweed Valley Village Timber Art Trail. Learn about plants, trees, wildlife, and insects, rare or endemic to this area by going on the Gondwanan Walk, where you can "go back in time" for an understanding of the progression of the flora and fauna from pre-Gondwanan times to the current day. Sponsor a plant or help us with artwork to add to the walk, and have a wonderful time doing so! © "Chillingham CTC" editorial material, courtesy and thanks to Adrienne Webber of Chillingham CTC ph. (02) 6679 1633. Getting here. Chillingham is approximately 835 kilometres - about 11 hours drive north from Sydney, via Murwillumbah, and approximately 145 kilometres - about 90 minutes drive south from Brisbane, via the Pacific Highway. Driving options include the Pacific Highway and Summerland Way in New South Wales, and from Queensland, via the Pacific Motorway and the inland Nerang - Murwillumbah Road through the spectacular scenic drive in the Numinbah Valley via the Gold Coast hinterland. Visit Chillingham - Transport Services Information for more transport information, including trains, coach and local bus schedules, taxis, airport, and transfer services. Northern Rivers Carpool provides locals and visitors with the opportunity to share transport in the region.